Maryland U.S Senate candidate Kathy Szeliga has sponsored a Facebook ad directing social media users to sign a petition on her website that advocates for the removal of local control among our county boards of education. 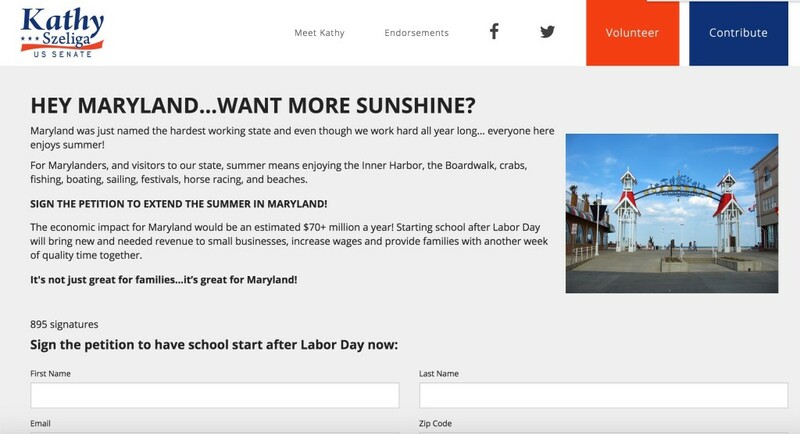 Szeliga has asked Marylanders to sign a petition to “extend the summer in Maryland,” essentially supporting a mandate that all Maryland public schools start classes after Labor Day. I understand the economics of the plan, I really do. And I understand why Gov. Hogan and Peter Franchot have lent their support to the initiative. It’s certainly a compelling argument for the Eastern Shore counties, but why is a candidate running for a federal office petitioning for a state mandate? I support local control in education. I believe Maryland counties should individually control their school calendars. What works on the Eastern Shore doesn’t always translate to what works best in the Western Maryland counties. In an article published by The Baltimore Sun in 2014, entitled “Task Force recommends starting school after Labor Day,” some Maryland school superintendents say they oppose delaying the start of the school year. “And state Superintendent Lillian M. Lowery has said she believes that local jurisdictions should be able to determine whether their school years start before or after Labor Day. In letters to the Maryland State Department of Education earlier this year, local superintendents strongly opposed a state mandate that they said would infringe on their autonomy to build a school calendar that fits their school communities’ needs. Baltimore City’s interim CEO, Tisha Edwards, said that the process of taking input on the school calendar from the community, parents and other stakeholders is important to the system. “The proposal represents an unnecessary impediment to the efficient operation of the district and places an additional burden on students, staff and families,” she wrote. “It also threatens the environment of mutual respect and school family empowerment that is one of the guiding principles driving the success of the transformation in Baltimore City schools. The Maryland Association of Boards of Education (MABE), representing all twenty-four local boards of education in the State, opposes the adoption of a statewide prohibition on starting the school year before Labor Day. On this date in 2015 (Jan. 19), MABE issued a press release announcing its opposition to starting all Maryland schools after Labor Day. You can read MABE’s press release below. David Hanlin, a fellow Hagerstown Rotarian and education activist, wrote an op-ed in 2014 that was featured in The Baltimore Sun, opposing a post-Labor Day start date for Maryland schools. “Comptroller Peter Franchot, by starting a petition drive, has embarked on a policy initiative to require all Maryland public schools start the school calendar after Labor Day. His policy proposal is given political cover through a commission report from the “Task Force to Study a Post-Labor Start Date for Maryland Public Schools.” That commission report is flawed, and I believe misguided. It will have deleterious consequences that have not been fully considered. As laudatory as “creating memories” and “quality family time” sound, they reflect the comptroller’s own middle class/upper class sensibilities. The proposal is about economic impact: The real motivation is to generate additional tax revenue — estimated to be $74.3 million — for the state and local jurisdictions that are heavily dependent on tourism. I realize the comptroller’s proposal is a politically popular position in many parts of the state, but having reviewed the commission report itself, I find it woefully inadequate in addressing the impact this action will have on children. Unlike children in middle and higher income households, children in lower socio-economic households generally do not have access to enrichment activities during the summer. The result is that children lacking summer enrichment can experience learning loss of as much as 30 percent compared to those who do have enrichment-filled summers. These children need to return to school sooner rather than later because for many families school provides the most constructive enrichment to which they have access. In Washington County, where I reside, at-risk children comprise nearly 50 percent of all children. Here, summer vacation equates to approximately 45 weekdays away from school. Under Mr. Franchot’s proposal, summer vacation would increase eight weekdays. Yes, those eight days would be made up by adding a day here and a day there during the school year. However, it is the extended absence during the summer that has a detrimental impact on students’ learning. This is an 18 percent increase in the length of vacation and length away from enrichment activities for at-risk children. They are the ones who suffer from his proposal. At a minimum, the report used to outline his proposal is flawed. It states that there is no firm evidence to indicate that extending summer vacation will have an impact. This statement is true but disingenuous. I can find no research to suggest that his position has been studied. If at risk children experience as much as 30 percent summer learning loss, how can extending the period when this occurs not have a negative impact? David Hanlin is chairman of the Rotary Literacy Task Force for the Rotary Club of Hagerstown. His email is d.hanlin@myactv.net. I rarely agree with the Maryland State Education Association and its sometimes questionable activism, but a broken clock is right twice a day, as the idiom goes. MSEA issued a letter on July 8, 2014, opposing state-mandated post-Labor Day school start dates. The Washington Post reported on MSEA’s letter here. Former Montgomery County Board of Education president Philip Kauffman echoed MSEA’s opposition to a post-Labor Day school start date in a September 24, 2014 letter that was sent to members of the Montgomery County delegation. Why is Delegate Szeliga using her U.S. Senate campaign to draw attention to a state issue? She’s running for a federal office. I’m sure she has a strategy in place, but in this instance, I’m just not sure I understand what said strategy is. Maybe somebody could explain it to me. Many conservatives and libertarians who vote in Maryland Republican primaries believe strongly in local education and local control. Supporting a statewide mandate that effectively limits the control a local school board has over its jurisdiction causes me serious pause when considering Delegate Szeliga’s U.S. Senate campaign. Incidentally, I am interested in learning whether all Maryland U.S. Senate candidates will advocate for the abolishment of the federal Department of Education. For conservatives and libertarians alike, that would be music to our ears. Delegate Szeliga is most obviously the choice of the Republican Establishment in Maryland. And there is nothing wrong with that. I agree with many of Szeliga’s positions. But on this issue (and a few others) I vehemently disagree with the Delegate. Kathy Szeliga is a reasonable Republican – and an electable Republican for that matter. I am positive, however, that she is open to discussing her position(s) and finding common ground with many of us Marylanders who support local control in education. I look forward to having that discussion in the future with Delegate Szeliga.